I actually watched an urban ax throwing contest on ESPN2. I am pretty certain I now know more about ax throwing than you do. I am also pretty certain this is way more about ax throwing than you want to know. I cannot wait for this to become an Olympic sport. What a fun way to settle world differences? I am thinking this sport could rival corn hole. Just think of the tailgate opportunities at football games to throw axes at a board. What a fun way to celebrate Texas OU weekend, A&M/LSU Thanksgiving or Alabama playing anybody on Saturday. It would be great rival football weekends with fans throwing axes at each other. The video is from New York City and the narrator actually discusses beer and sharp objects in the same environment. He goes on to say that after a couple of beers it will help you throw the ax. In a bar after a couple of beers, you probably should not give a person an ax. But in Texas you certainly do not want to try to take it away from them either. They might likely shoot you. One of the women in the video states that ax throwing is a great stress relief. I bet it would relieve stress if you imagined someone as the target. Who can forget Johnny Carson and Ed Ames on The Tonight Show? Get you Ax together and start tossing. Tuesday, January 1, 2019 – Happy Whooping New Year! Well, Skit. Skat. And how bout that? How about them Aggies? Chomp. Chomp. What away to start a new year! Congratulations to The Texas Aggie Football team, Coach Jimbo Fisher and Traveon Williams for a great game. Record setting runs for Traveon. What a game for Cullen Gillespia? The epitome of The Twelfth Man. Jimbo’s first year: 9 wins and four losses. Losses to Clemson by two and Alabama was scared. Time ran out against Mississippi State and Auburn. And then there was the LSU game followed by a convincing Gator Bowl victory. Not bad, Jimbo. It’s not the way it used to be! But that was last year. Today I have on my LSU Tiger T-shirt. It is the formal one with the mardi gras bead design. GEAUX TIGERS! I am headed to have the traditional New Year’s black eyed peas and cornbread and New Year’s Day football watching. Speaking of Day, here’s to my friend Kathy who achieved a bucket list item today– Seeing Ohio State play in the Rose Bowl. I’ll watch for you KD. Please wave to me and Ms. Navasota. It is the eve of New Year’s Eve; ah bitter chill it was. Wait that is The Eve of St. Agnes by Keats when the bitter chill takes place. That is not until January 20. We also have Alfred Lord Tennyson’s version St. Agnes’ Eve. I guess plagiarism was not as evident back then. Speaking of saints, chills, and Tennyson, how about that Charge of the Light Brigade by Notre Dame yesterday? Half a yard; half a yard; half a yard onward into the valley of death rode the Irish. Notre Dame could not summon enough saints and begorrah to even make it interesting. At least Oklahoma tried a comeback. I told you that ND does not do well in a bowl with Cotton in its name. Here’s what I’m thinking. Next football season why don’t Clemson and Alabama play to start the season? That can be their very own personal national football championship. Then in January of 2020 two other teams can have a shot at the big trophy stick. Other fans would like to wear tacky national championship hats too. Tomorrow, actual New Year’s Eve starts the SEC Bowl Conference. Tomorrow we find Missouri versus Oklahoma State and Unranked North Carolina versus the fighting Texas Aggies. These games are followed by LSU, Mississippi State, Kentucky and Georgia. And to get thee to a summary. The entire Pride of the Big 12 Conference rests between Oklahoma State and THE University of Texas. Missouri is peaking and it depends on which Oklahoma State takes the field. But Georgia is really pissed off. Those Dawgs are mad dawgs. Run Bevo! Tomorrow – The Aggies and UT in the Gator Bowl 1957 history. Yes, the SEC – it just means more! The Committee has spoken. Alabama, Clemson, Oklahoma and Notre Dame. Those are the four that are in. This leaves Georgia, Ohio State and most everybody else mad. The Big 12 wanted OU and not two teams from the SEC. Everybody is tired of Alabama except Alabama. They just keep on rolling. I am so happy Notre Dame is playing Clemson on December 29 in the Cotton Bowl. The Cotton Bowl has never been kind to the Irish. Go Clemson. There are 33 bowl games between December 15 and January 1. That is way too many to give comments. Unless you or your child or grandchild attends one of the universities, no one really cares about who is playing until the end of December. Let’s take a preview of some of the action. One more thing. The SEC. It just means more. As in, 11 teams in bowl games. Wednesday, November 28, 2018 – Renew the Rivalry? 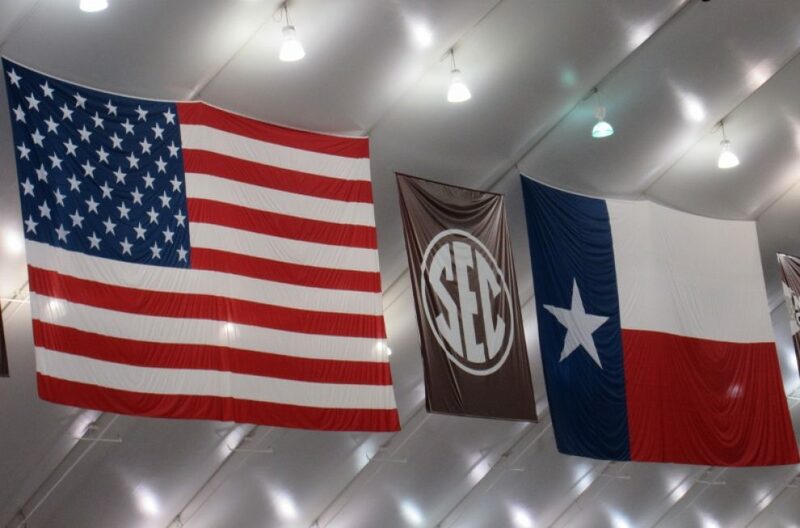 Renew the Rivalry between Texas A&M and THE University of Texas by LAW. WHAT? State Representative and Aggie, Lyle Larson, filed HB 412 for the 86th Texas Legislature that requires the two universities to schedule an annual nonconference football game the fourth Thursday, Friday of Saturday of November. HWIT – Waste of paper; waste of time; and LSU and the SEC may have plenty to say about that date. I would not be opposed to a game at a neutral site. Jerry World would probably like to host it. It would be good for recruiting, but I do not think legislation is needed to make it happen. It seems that Alabama and Auburn did not play one another for decades due to contract disputes. It seemed to work out ok for both of those schools. Representative Larson wants to avoid such a situation. HWIT, I would rather not play THE University of Texas ever again if it meant the Texas Aggies would take over as annual number one with multiple national championships. Big scores; ugly helmets, home cooking and more. Let’s move the chains down the sideline and hand out my Monday after college football awards. Penn State 38 and Maryland 3 – The Always A Contender for Ugly Helmet Award goes to Maryland. Can there possibly be a football helmet as ugly? Penn State says yes – Ohio State. Michigan 39 Ohio State 62 – So another Ugly Helmet Award goes to the Buckeyes of Ohio State for their pot leaf helmets. I award Michigan the Where’s Waldo Wolverine Award. Did the real team miss the bus? Clemson 56 South Carolina 35 – Clemson wins the Palmetto Trophy. Uncle Will Muschamp better get the Gamecocks winning. He wins The Coach’s Hot Seat for 2019. Alabama 52 Auburn 21 – Alabama wins the Tina Turner Award as they continue Rolling Down the River! Baylor 35 Texas Tech 24 – Kliff Kingsbury receives the Mac Davis Award because Kliff will be seeing Lubbock in his review mirror. Texas 24 Kansas 17 – I award THE University of Texas the Back to the Big 12 Championship Award. Enjoy your Hat Trophy, because the Big 12 One goes back to Oklahoma next Saturday. To the Kansas Jayhawks I award the Robert Frost Award because you have Miles to go before you sleep with a football trophy. Let’s see. It seems I am leaving a game out. What game would that be? Load up the trailers and tote off the awards. Seven Overtimes! Miss Reveille as the Aggies take the field. She usually doesn’t bark. She must have known something. Pepto Bismal Award for upset as in the game, the LSU fans, my stomach. Unbelievable Stamina Award – this award goes to the teams, coaches and fans. Lastly – I award the Referees at Kyle Field the Home Cooking Award. Sometimes it’s hard to see out of bounds on the home field. The Bowl Projections are out. Here is a bowl game I would NOT like to see. Oregon in their bright, yellow, banana, high liter uniforms, playing Washington State in all red uniforms on the Boise State blue field. It could be called The Primary Colors Bowl. In what was thought initially to be a cupcake, visitors’ big money gate receipt, let the benchwarmers play weekend of football turned out to be anything but. There were lots of butts shown this unpredictable weekend. But let’s begin with The Winner, Winner Chicken Dinner Award. There are two of these. One award goes to The Campus of The Citadel – The Military College of South Carolina. Granted when the Alabama Tri Delta football team ended the second quarter, the real Alabama team scored forty more points in the second half for half of a 100. But holding Bama to a 10-10 tie at half-time should count as a win against The Tide. There is probably a reason that one out of three graduates of The Citadel becomes a military officer. There is probably a statistic that says one in three Alabama football players go professional. The second Winner Award goes to the Kansas Jayhawks for scoring 40 points against the Sooners of Oklahoma. Again, the scoreboard differed, but 40 points for Kansas when not playing basketball is great. A question I want to know of the Jayhawks is this – is there grass for Les Miles to eat in Kansas or just wheat? The OMG and Poopy Undies Awards go to Ohio State University. I am awarding Oklahoma State the Spoiled Milk Award for upsetting West Virginia and allowing THE University of Texas to share a portion of the Big 12 Championship. In THE University of Texas and Iowa State game, I really thought the Cyclones would do better against Texas. But I was reminded cyclones are in the Pacific. I vote to change Iowa State’s mascot to Trailer Eating Tornadoes or Devastating Hurricanes. I think either one of those names will fit in better in the other Big 12 schools – all ten of the Big 12. There are too many to count awards for Home Cooking given to the referees. There were many calls that favored the home team, but let’s give refs one for the illegal motion called on The Citadel that cost field goal yardage. It seemed to me that Alabama got an extra second off the play clock before the yellow flag was thrown. Of course in Alabama people are genetically disposed to fry all foods. The Citadel was only one team who was fried by the refs. In a really good game between The University of Alabama at Birmingham and Texas A&M – I award The Texas Aggies the Scoop and Swoop award (Sorry Adidas) for recovering the fumbled kickoff and scoring a touchdown. Of course, I must give my boyfriend, Trayveon some love for his touchdowns. I am going to give A&M a Winner Award too for beating Alabama – Even though it was Alabama Lite. NOOOO – Say it ain’t so. The Aggies are favored against LSU next week? Lee Corsehead will try to pet Reveille again and the Aggies will lose for sure. But, it’s Kyle Field and the 12Th Man. We Aggies do want the fans from LSU to feel welcomed and safe. Therefore, be sure to check out the Aggie Uber pick up truck. I feel certain there is a substantial discount if you ride in the bed of the truck.